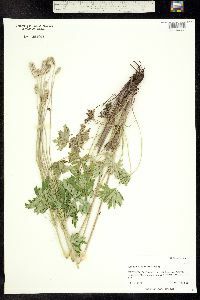 Aerial shoots (20-)30-70(-80) cm, from caudices, rarely with very short ascending rhizomes, caudices ascending to vertical. Basal leaves (2-)5-10(-13), ternate; petiole 9-21 cm; terminal leaflet sessile, broadly rhombic to oblanceolate, (2.5-)3-5(-6) × (3-)4-10(-14) cm, base narrowly cuneate, margins crenate, or serrate and deeply incised on distal 1/2, apex narrowly acute, surfaces strigose, more so abaxially; lateral leaflets 1-2×-parted and -lobed; ultimate lobes 4-10(-13) mm wide. 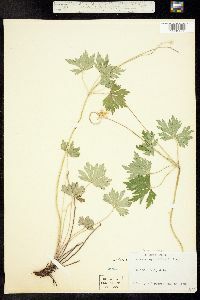 Inflorescences (1-)2-8-flowered cymes, sometimes appearing umbellike; peduncle villous to densely villous; involucral bracts 3-7(-9), 2(-3)-tiered (can appear 1-tiered), ternate, ±similar to basal leaves, bases distinct; terminal leaflet sessile, rhombic to oblanceolate, 2.5-6.5 × (1-)1.5-2(-2.5) cm, bases narrowly cuneate, margins serrate and incised on distal 1/3-1/2, apex narrowly acute, surfaces puberulous, more so abaxially; lateral leaflets 1(-2)×-parted or -lobed; ultimate lobes (4-)6-10(-15) mm wide. Flowers: pedicel usually appearing bractless; sepals 4-5(-6), green to whitish, oblong to elliptic or ovate, 5-12(-15) × 3-6 mm, abaxially silky, adaxially glabrous; stamens 50-75. Heads of achenes cylindric; pedicel 10-30 cm. Achenes: body ovoid, (1.8-)2-3 × 1.5-2 mm, not winged, woolly; beak usually recurved, (0.3-)0.5-1 mm, hidden by achene indument, glabrous. 2 n =16. Flowering summer (Jun-Jul). 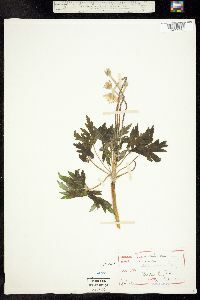 Prairies, dry, open woods, pastures, roadsides; 300-3000 m; Alta., B.C., Man., Ont., Que., Sask. ; Ariz., Colo., Conn., Idaho, Ill., Ind., Iowa, Kans., Maine, Mass., Mich., Minn., Mo., Mont., Nebr., N.H., N.J., N.Mex., N.Y., N.Dak., Ohio, Pa., R.I., S.Dak., Vt., Wis., Wyo. 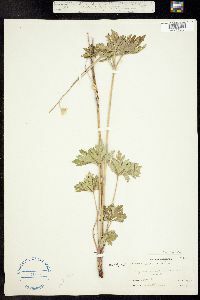 The cymes of Anemone cylindrica may appear 1-tiered because the second tier of involucres is closely nestled among the leaves of the first tier. 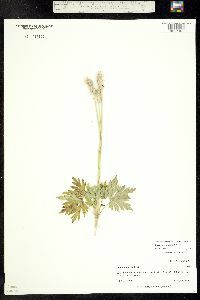 The cymes then resemble umbels with unusually leafy involucral bracts; they might be misinterpreted as such. 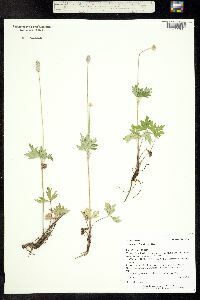 Anemone cylindrica was used medicinally by Native Americans for headaches, sore eyes, and bad burns, as a psychological aid, and as a relief for tuberculosis (D. E. Moerman 1986). Infrequent throughout the lake area. 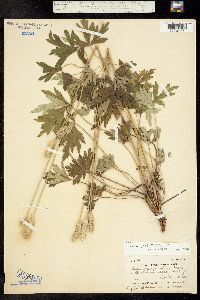 It prefers a very sandy or gravelly soil and is usually found in prairie habitats along railroads and roadsides and in open woodland, usually on open, black and white oak ridges. 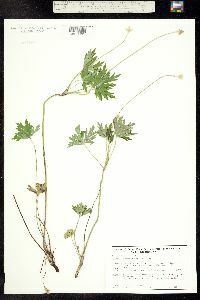 Apparently it prefers a dry habitat, although the only place I ever saw it growing in abundance was on a gravelly bench on the north side of Wall Lake in Lagrange County, which was only a few feet above the water level. This bench was made several years ago when the water level of the lake receded. In this moist habitat the plants were common and vigorous, one of the specimens having 7 fruiting heads. Plants 3-10 dm, from a short caudex; basal and involucral lvs similar, the former several, the latter 3-10 and commonly twice as many as the mostly naked peduncles, both types petiolate, broad, deeply 3-5-parted into basally narrow and cuneate segments that are again few-toothed or cleft above the middle; peduncles mostly 2-6, 1-3 dm; sep 5(6), greenish-white, 8-12 mm long; styles crimson in life; fruiting head dense, cylindric, 2-4.5 cm, scarcely 1 cm thick; achenes densely woolly, 2 mm, the style 0.5-1 mm, subglabrous, seldom strongly spreading; 2n=16. Dry, open woods and prairies; Me. to B.C., s. to N.J., O., Mo., and Ariz. June-Aug.